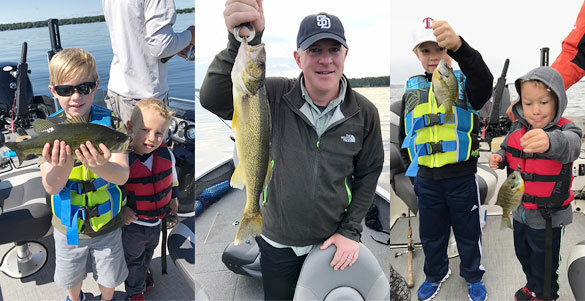 @thefamilyfishes says – Fishing with Dan the Walleye man guide service was the best decision of our vacation! Dustin was patient and kind to our young kids who were kept safe and busy with as many sunfish as they could handle and even some bigger fish! 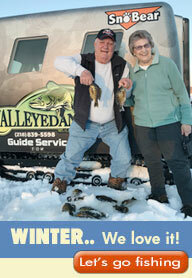 Meanwhile; Mom and Dad were free to bring in the big bass and eater walleye up front. Bruce gave us our best walleye day making for a special father/son fishing trip! 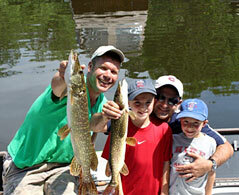 Our entire family learned more about fishing and had a great time together! We can’t wait to get back on his boat in July! 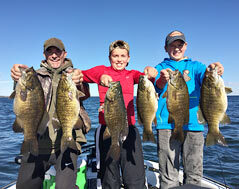 Nouk, Dylan and I had an excellent morning of fishing last Sunday with your premier guide, Bruce Meinz. Everything was perfect: the weather, the lake, the boat, the guide, and most importantly, the fishing! We each caught our limit of “eatin’ size” black bass and I caught my personal lifetime record large mouth (about 16 – 18 inches). Bruce was the best guide we’ve ever used on either fresh or salt water. What a nice guy!! Thanks for making our Fourth of July Weekend a superior family outing. I can’t tell you enough just how much we enjoyed fishing with you! It was exciting enough for us just being on the water with you, that alone, would have been memories for us that would have lasted a lifetime, but adding the success we had in catching fish of a lifetime with you made the whole day very magical. After I met and saw Al win that bass tournament on Lida in the mid-seventies when I was ten,he was my fishing idol growing up and even through my twenties and thirties, I would look in the TV guide to make sure I didn’t miss his TV show’s, especially in the winter and spring. Now,my kids and I make sure we don’t miss any of your show’s and they idolize you like I did with Al and to live in the same town makes it even more special. We sure hope you’re able to continue the show and will pray for you and Shelly to be able to do so. I do know one thing for sure, you will be the next fishing legend/icon of Brainerd and God’s sign to you was that magical day you had on the water with Al. Thanks again Dan ! Dan, My boys (Spencer–8 and Christian–6) and I just wanted to say THANK YOU for a GREAT fishing day on Gull Lake a few weeks ago (July 2011). The boys had the time of their life, were fascinated by all the “cool stuff” you showed them on your boat, and still talk about the legendary fish stories (Jingles) that you entertained them with. The fishing was fantastic and just right for the kids. I appreciated your unbelievable patience with the boys, your ability to put us right on top of the fish, and your interest in not having Dad lift a finger! Fishing has never been more easy and enjoyable for all of us! I came to a realization that by the time I rent a boat, ask around & buy the hot tackle/bait, try to find the fish, tangle with my kids lines, etc…it’s just not worth the frustration and the few dollars I might save trying to do it alone. 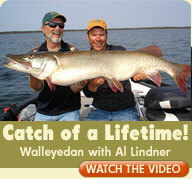 I strongly encourage a fishing trip to start and end your vacation with Walleye Dan. See you next July! By the way, you did a great job cleaning the fish for us and they tasted great–especially the large walleye that Christian caught! Thanks, Dan. Hi Shelly, my son Nolan wanted me to get you this picture of his northern he caught last Tuesday on Gull, a week before his 6th birthday. Bruce was great! Thank you for the happiness you helped to bring to Deryk his family when his wish to go on a fishing trip in Minnesota came true. Deryk had an awesome time fishing with you. The family said you “made” the trip. Deryk is already saving his money so he can go fishing with you again! Attached are some pictures. On behalf of Deryk and his family and all of us at Make-A-Wish of Minnesota, thank you for the gift of a great experience, long lasting memories and smiles. Thank you for helping us make Deryk’s wish come true! I just wanted to send a note and let you know how great of a day we had today fishing with your company. First, we came to Grand View Lodge on a weekend getaway. We called yesterday evening and found an opening for this morning at 8. I knew it was going to be a great time, even during the phone call. I believe we spoke with Dan’s wife and she was so kind and accommodating. I had explained that my wife had never been fishing before and that I was an experienced angler and the opportunity to get out after such late notice was nothing more than exciting for us. Bruce met us early at the dock and was prepared from the get go. We fished in the absolute densest fog I have ever experienced but hit our first points and were immediately on walleye’s. My wife got her first taste of catching fish and we were having a blast. To make a long story short, Bruce was absolutely outstanding. Not only did he help Michelle, but he was kind and knew where to go. We laughed, we caught fish and most of all, we had an experience my wife will not soon forget. To make the day better, my wife, holding true to “beginners luck” caught a 26” walleye and short of elated, I couldn’t believe it, even though I had a hunch that it was a “beginners luck” day. For my wife’s first experience with fishing, this was the best! I wont carry on, but I have to say the day couldn’t have been better. We own a family resort on Balsam Lake WI, I take customers fishing and know what it is like to be a guide and service customers. I have to say, you guys are incredible, you know how to make memories and service your clients from the moment their feet touch to boat to when the fish are cleaned, and in the bag. Bruce was just a true joy and made the day that much more special. I know what it is like to own a business and positive feedback is always nice but “constructive” feedback is even better and I can say, I don’t have any, everything was flawless and perfect. Please give my thanks to Bruce, and plan for us next year! Braden and I would just like to say thank you again for a great trip on Leech. It is a trip that him or I will not soon forget. He talks about the trip all the time and yesterday we were out on Whitefish and he had to do the fish call you showed him….. and yes it worked. We ended up releasing a 22 1/2 inch walleye. Fun stuff. I have attached the pictures from our trip with you. I did hear that you and Braden made the paper (The Northland Press I think). I will have to try to find a copy. Anyway thanks again and hopefully we can do it again soon. PS: Let me know if you still need that bait boy / boat washer!!! Just wanted to say a huge thank you for the great fishing last Monday morning, we all really enjoyed it. The boys are still talking about the outing and how fun it was, and of course Michael has been walking on air after catching that big Northern! Thanks again for being a great guide, and especially for helping me make some great memories for my kids!! Thanks for an awesome fishing trip. It was one of those exceptional days where everything was perfect. The bass fishing was great, weather outstanding, and we got to spend time with good friends. We look forward to making this an annual trip. I would like to thank you for the best fishing trip I have yet to have last Friday. You made some unforgettable memories for me, my dad, and the kids. It is always our pleasure to fish with you or one of your guides. Your services are hands down the best in the industry. I was wondering if you could send me any pictures that you might have of the walleye that Jaxon caught. Also I thought I heard you say something about that picture going in some weekly paper. If that is the case could you let me know how I could obtain a copy of that. We are looking forward to our next trip with you this fall.